Weston McKennie thought back to last summer, when he was an 18-year-old midfielder trying to impress at his first preseason training camp with Schalke’s first team. Leon Goretzka, one of the club’s leaders, delivered a message. Having left the FC Dallas Academy to sign with Schalke in the summer of 2016, McKennie spent a season with the Under-19 team and made his first-team debut on May 20 as a late second-half substitute. He earned a spot on the senior roster and made his first German league start Sept. 19 at Bayern Munich, then was picked for a new-look U.S national team and showcased ball-control skills when he dribbled into the penalty area and scored in his debut , a 1-1 exhibition tie at Portugal on Nov. 14. McKennie wound up playing in 22 of 34 league matches plus three in the German Cup as Schalke finished second, gaining a Champions League berth with its highest place in the Bundesliga standings since 2009-10. He bounced back quickly from a partially torn meniscus in his right knee that sidelined him from Jan. 21 to March 3. 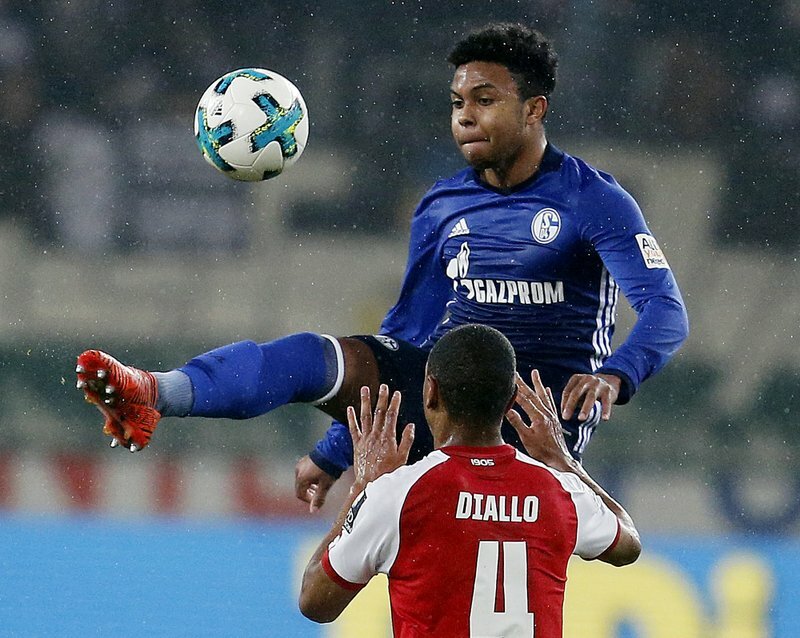 Schalke showed confidence, giving McKennie a five-year contract last September that extends through the 2021-22 season, two years longer than his first deal. McKennie is on the U.S. roster for Saturday’s exhibition against Ireland in Dublin. Sarachan, who replaced Bruce Arena after the Americans were eliminated in World Cup qualifying last October, said McKennie, 19-year-old midfielder Tyler Adams and 22-year-old defender Matt Miazga put themselves in consideration for a World Cup roster had the American advanced to the tournament in Russia. Born in Texas, McKennie lived in Kaiserslautern, Germany, from age 6 to 9 while his father was stationed at Ramstein Air Base, and the young fan met Landon Donovan and Carlos Bocanegra before a U.S. exhibition against Poland at Fritz-Walter-Stadion in 2006. Back in West Elm, McKennie spent seven years in the youth system of FC Dallas, which hoped to sign him to a homegrown player contract. He signed a letter of intent with the University of Virginia, then decided against college and Major League Soccer to sign with Schalke. He lived in a hotel when he first arrived in Gelsenkirchen but stayed much of the time with Nick Taitague, a midfielder from Virginia who signed with Schalke in 2017. McKennie got his own place last October and moved in following the winter break. Adjusting was somewhat easier because he had learned the language when he lived in Germany as a child. “Everything just started to refresh and get familiar again,” he said. Schalke has played the 6-foot-1 McKennie in defensive and playmaking midfield roles, and coach Domenico Tedesco experimented with him at center back in a three-man back line during an exhibition. He joined star 19-year-old midfielder Christian Pulisic, his friend from youth national team training, for the first time on the senior national team in Monday’s 3-0 win over Bolivia in Chester, Pennsylvania. “I think he can be a guy that can play deeper but also has a comfort level of getting forward out of the midfield position and creating,” Sarachan said. Living on his own, 5,000 miles from home, has changed McKennie.